I moved again. This time, it wasn’t as significant as the last. This time, it was simply across the hall; a mere 6 ft. away [from door to door] from 650 sq. ft to 1325 sq. ft. For the most part, the move has been positive. Aside from the fact that my lower back is somewhat sore from moving a couch, massive television stand, and other assorted heaviness on my own, I can relax with my feet up knowing that the apartment move is about 95% done. What’s a new home without reliable internet? Approximately 8 months ago, as I prepared to move into my current apartment building, I investigated my internet service options. At the time, I was limited to three service providers: 1) Millenium Digital now known as Broadstripe, 2) Clearwire, or 3) Qwest. Not wanting cable, and after receiving numerous comments concerning Cleawire, I decided to sign up for Qwest. With a 7 Mbit DSL plan, I was averaging roughly 5.8 down and 600 up. Not at all shabby for a few different laptops, audio streaming, and some XBox action. How are you connecting your computer to the internet? Phone line between the wall jack and the Actiontec DSL modem. This is an internet-only plan. Are there any phone line filters setup for your telephone? Again, no telephone. DSL line only. Will you try connecting your modem to another phone line in the apartment? Sure. Slow internet persists. I requested that my service be disconnected but the representative insisted I wait until a third tech properly checked my connection. Properly, as in the first two techs were obviously poking the wrong wires in the switch room. I’m ready to jump ship. Fortunately, I am not locked into some type of yearlong commitment with Qwest – my account simply switched from one unit to the next. Shoddy customer service is unavoidable, by what I’ve experienced thus far has transformed my feelings about Qwest overnight. 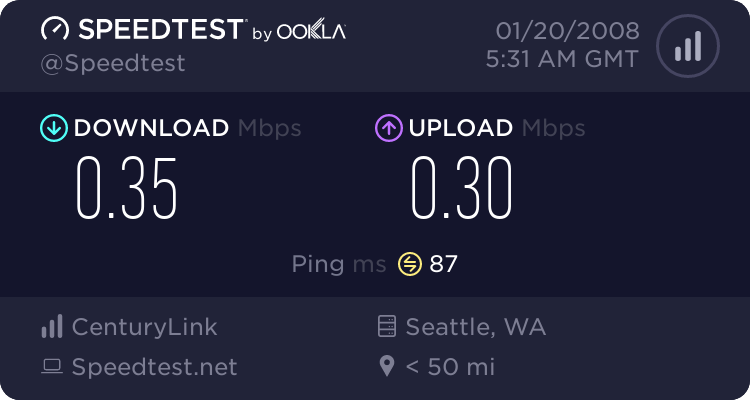 Are you using Qwest DSL for your internet service? What are your thoughts? Speakeasy recently started offering service to my apartment building and am seriously considering a switch. For the price, I would sacrifice speed for reliability. A worthwhile trade-off if performance is consistent. My office uses Speakeasy and has had no issues whatsoever. Qwest vs. Speakeasy. What do you think? Syl and I were up until 4am last night after taking Boo to a 24-hour emergency veterinary hospital. Nothing says sick puppy like nightmarish vomiting without warning. Dogs Flu. Yay! Not only did Boo vomit on the couch in two separate areas, she managed to project throw up [what looked like something that came out the wrong side] all over the back of the passenger seat in my car.